Description of the heart as a pump has been dominated by models based on elastance and compliance. Here, we are presenting a somewhat new concept of time-varying passive and active elastance. The mathematical basis of time-varying elastance of the ventricle is presented. We have defined elastance in terms of the relationship between ventricular pressure and volume, as: dP = EdV + VdE, where E includes passive (Ep) and active (Ea) elastance. 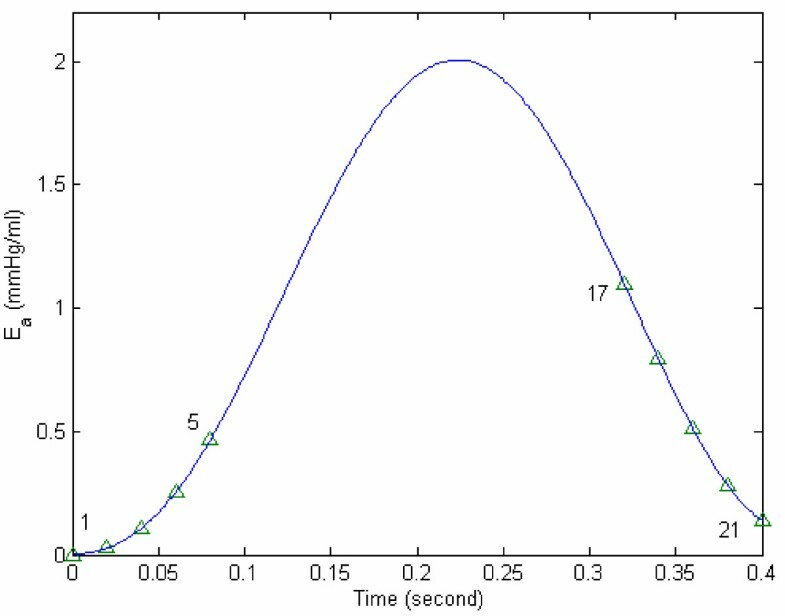 By incorporating this concept in left ventricular (LV) models to simulate filling and systolic phases, we have obtained the time-varying expression for Ea and the LV-volume dependent expression for Ep. Using the patient's catheterization-ventriculogram data, the values of passive and active elastance are computed. Ea is expressed as: ; Epis represented as: . Ea is deemed to represent a measure of LV contractility. Hence, Peak dP/dt and ejection fraction (EF) are computed from the monitored data and used as the traditional measures of LV contractility. When our computed peak active elastance (Ea,max) is compared against these traditional indices by linear regression, a high degree of correlation is obtained. As regards Ep, it constitutes a volume-dependent stiffness property of the LV, and is deemed to represent resistance-to-filling. Passive and active ventricular elastance formulae can be evaluated from a single-beat P-V data by means of a simple-to-apply LV model. The active elastance (Ea) can be used to characterize the ventricle's contractile state, while passive elastance (Ep) can represent a measure of resistance-to-filling. The heart may be conceived as a pump that receives blood from a low-pressure system and raises it to a high-pressure system. Although the mechanism responsible for generation of wall stress (and hence left ventricular (LV) pressure) is contraction of the myocardial fibers, an analytical formulation linking the myocardial and LV dynamics is still lacking. In the absence of this formulation, a popular way of linking LV pressure and volume dynamics is by means of LV compliance (or elastance) [1, 2]. Although this yields the cyclic values of elastance and compliance, this concept does not provide an intrinsic measure of elastance and compliance for the contractile state of the LV. The concept of compliance or elastance was first employed for blood vessels , by relating incremental cross-section area (or volume) and transmural pressure. Warner appears to be have been the first to adopt a compliance description for a dynamic heart . In Warner's description, a mean value of compliance is adopted for diastolic phase and another mean value for systole, with abrupt transitions between the two states. 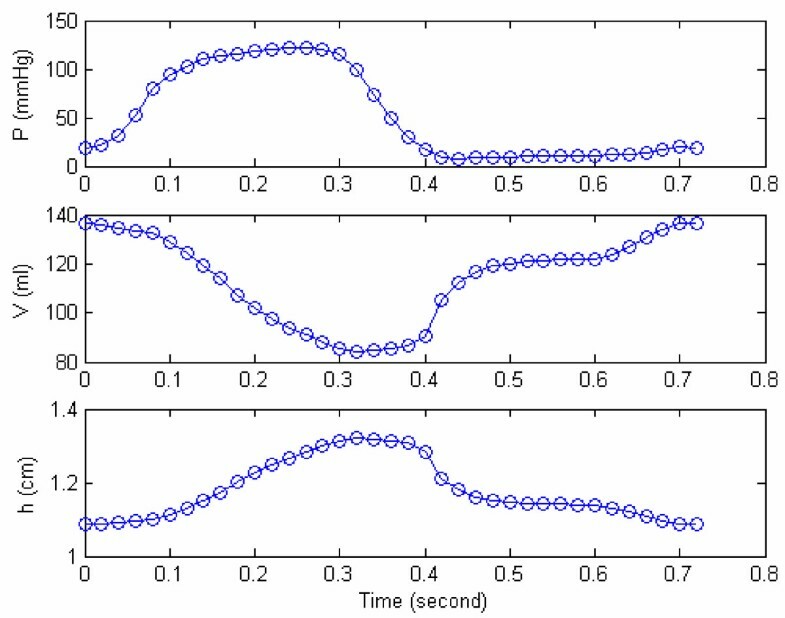 Defares  avoided the stepwise transition between diastolic and systolic compliance, by making elastance a continuously varying function of time. Later, the concept of a continuously varying compliance or elastance was adopted by a number of investigators with diverse variations [2, 6, 7]. Nevertheless, they all share the concept of a simple and extrinsic compliance term as an adequate description of ventricular mechanics during the cardiac cycle, based on monitored values of LV pressure and volume. to represent the elastance of the contracting LV, where Vd represents the unstressed LV volume corresponding to zero LV-pressure, obtained by drawing a tangent to P-V curves at end-ejection, as illustrated in Figure 1. This model gave rise to the development of the end-systolic pressure-volume relation (ESPVR) as a measure of contractility [9–14]. 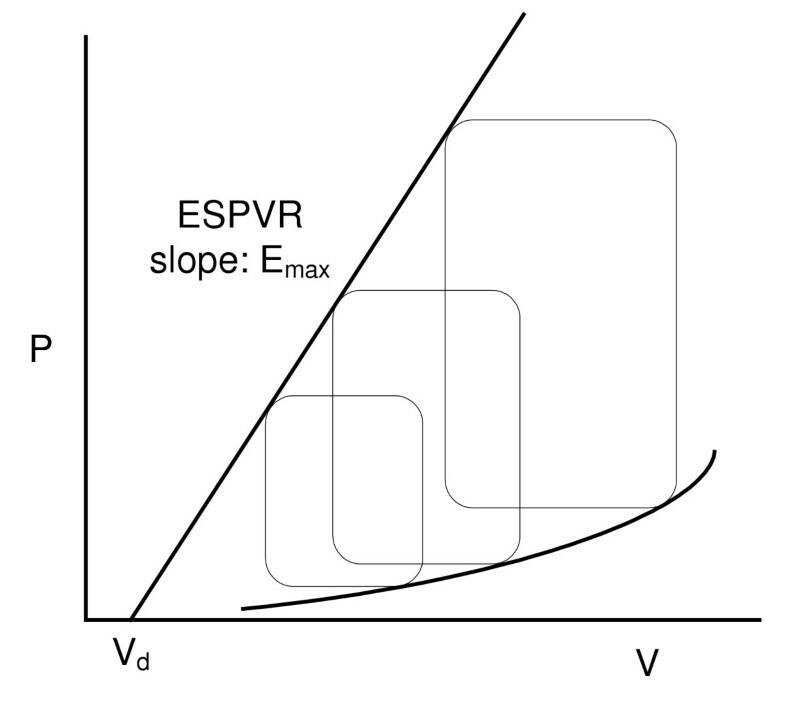 Schematic drawing of P-V loops and end-systolic P-V relation (ESPVR). Schematic drawing of P-V loops and end-systolic P-V relationship (ESPVR) with a positive volume intercept Vd. The slope of ESPVR line is deemed to be Emax. However, the determination of the maximal slope Emax and of the volume-axis intercept (Vd) of the tangent to the P-V curve at end-ejection (as a measure contractility of the cardiac muscle) is not only unreliable [11, 15], but also requires generation of multiple P-V loops under variations loading conditions [11, 15]. It is hence impractical to use clinically for a specific LV catheterization-ventriculography data. Above all, all of these variations in the concept of E obtained from LV pressure-volume data fail to explain the phenomena of LV suction and LV pressure drop during early filling as well as the generation of LV pressure increase during isovolumic contraction. We have hence come up with a new concept of dual passive and active elastances operating throughout the cardiac cycle. The passive elastance (Ep) represents the LV pressure response to LV volume change (to LV volume increase during LV filling phase and to LV volume decrease during LV ejection phase). However, simultaneously, we also have active elastance (Ea) representing the contraction of the left ventricle due to its sarcomeric activation (and the development of force between the actin-myosin units) and relaxation (due to disengagement of the actin-myosin units). LV Ea develops after the start of isovolumic contraction, becomes maximum some time during late ejection and thereafter decreases and becomes zero during diastolic filling. On the other hand LV Ep starts increasing after the initiation of LV filling as the LV volume increases. It reaches its maximum value at the end-of-filling phase, remains constant during isovolumic contraction, and thereafter decreases during ejection (as the LV volume decreases). While the generation of Ea helps us to explain the development of the LV pressure increase during isovolumic contraction, the decrease of Ea during diastole helps us to explain the decrease in LV pressure during early filling. The incorporation of both Ep and Ea helps us to explain the LV pressure changes during the filling and ejection phases. The subjects in this study were studied in a resting recumbent (baseline) state, after premedication with 100–500 mg of sodium pentobarbital by retrograde aortic catheterization. Left ventricular chamber pressure was measured by a pigtail catheter and Statham P23Eb pressure transducer; the pressure was recorded during ventriculography. Angiography was performed by injecting 30–36 ml of 75% sodium diatrizoate into the LV at 10 to 12 ml/s. It has been found by using biplane angiocardiograms that calculated orthogonal chamber diameters are nearly identical . These findings are used to justify the use of single-plane cine techniques, which allow for beat-to-beat analysis of the chamber dimensions. For our study, monoplane cineangiocardiograms were recorded in a RAO 30° projection from a 9 in image intensifier using 35 mm film at 50 frames/s using INTEGRIS Allura 9 system at the Nation Heart Centre (NHC), Singapore. Automated LV analysis was carried out to calculate LV volume and myocardial wall thickness. The LV data, derived from the cineangiographic films and depicted in Figure 2 consists of measured volume and myocardial thickness of the chamber as well as the corresponding pressure. All measurements are corrected for geometric distortion due to the respective recordings systems. A case study of measured LV pressure, volume and wall thickness during a cardiac cycle. An example of a patient's measured LV pressure, volume and wall thickness during a cardiac cycle; t = 0-0.08s is the isovolumic contraction phase, t = 0.08s-0.32s is the ejection phase, t = 0.32s-0.40s is the isovolumic relaxation phase, and t = 0.40s-0.72s is the filling phase. Note that even after 0.4 s, the LV pressure still continues to decrease from 17 mmHg (at 0.4s, at start of filling) to 8 mmHg at 0.44s. In Figure 2, it is noted that during the early filling phase, LV pressure decreases even though LV volume increases. This phenomenon is defined as the 'LV suction effect', which will be explained later by using our concepts of active and passive elastances. This phenomenon is also depicted in Figure 3 and Table 1. 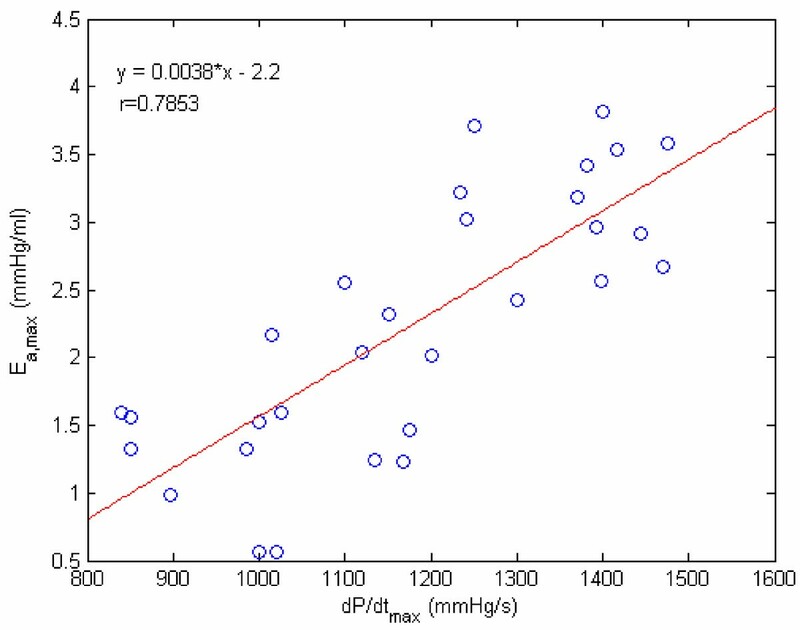 Relationship between LV volume and pressure for the data of figure 2. 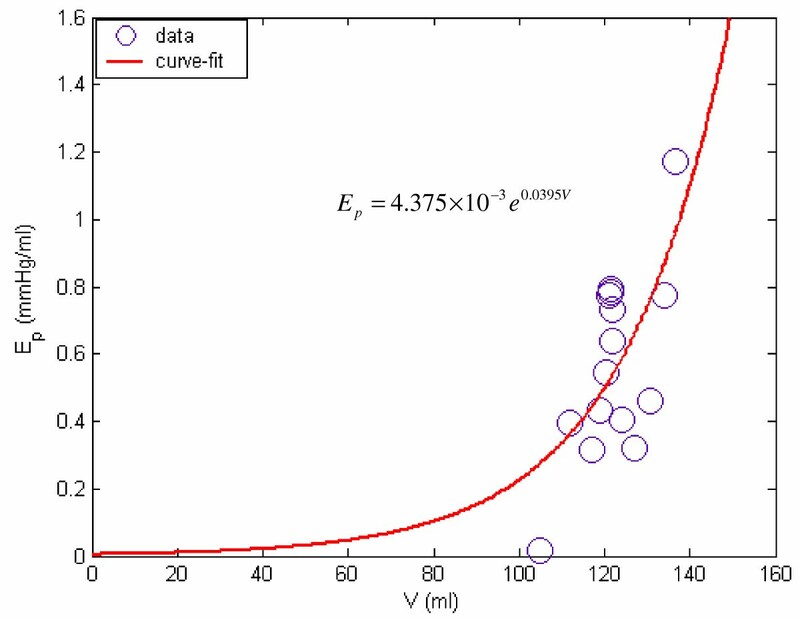 Relationship between LV volume and pressure for the data of Figure 1. Points (21–36) constitute the filling phase, (1–5) constitute the isovolumic contraction phase, (5–17) constitute the ejection phase, and (17–21) constitute the isovolumic relaxation phase. Note that after point 21, the LV pressure decreases; this characterizes LV suction effect. E represents LV elastance (mmHg/ml). where Ep 0is the passive elastance coefficient, z p is the passive elastance exponent, and V is the LV volume; its derivation is provided in a subsequent section. where (i) t is measured from the start of isovolumic contraction, (ii) the parameter Ea 0is the active elastance coefficient, (iii) the time-coefficient (τ C ) describes the rate of elastance rise during the contraction phase, while (τ R ) describes the rate of elastance fall during the relaxation phase; (iv) the exponents "Z C " and "Z R " are introduced to smoothen the curvatures of the E a curve during isovolumic contraction and relaxation phases; (v) the parameter d is a time constant whose (to be determined) value is during the ejection phase, and (vi) u(t-d) is the unit step function, u(t-d) = 0 for t<d. The rationale for equation (8), as provided in the next section, is based on Ea incorporating parameters reflecting the (i) generation of LV pressure during isovolumic contraction, (ii) decrease of LV pressure during isovolumic relaxation and early filling, and (iii) the LV pressure-volume relationship during filling and ejection phase. Based on equations (5–8), our hypothesis is that both Ea and Ep contribute to the relationship of LV pressure and volume. While Ep incorporates LV pressure change due to LV volume change, Ea incorporates the effect of LV myocardial activation in the generation of LV pressure during the isovolumic phases (when the LV volume remains constant). Since Ea is deemed to be the basis of LV pressure generation, its variation (as given by equation 8) corresponds to the LV pressure variation. where i is a time instant during the isovolumic contraction and relaxation, Vi and PLV,i are the monitored LV volume and pressure at this instant, and Eped is the passive elastance at the end-diastolic phase. So that its constituent parameters have physiological significance as indicated following equation (8). and determine its remaining parameters d, τ R and ZR to fit the measured pressure-volume data. For the sample data of Figure 2, the variation of Ea is depicted in Figure 5, along with the values of its parameters. We now propose that Ea can be employed as an index of contractility. The data of figure 2 is fitted with equation (8). When the patient data of Figure 2 is fitted with equation (8), the resulting parameters values are obtained as: Ea 0= 1.48 mmHg/ml, τ C = 0.1555 s, Z C = 1.631, d = 0.28 s, τ R = 0.07935 s, Z R = 2.267 s, Ea,17= 1.1 mmHg/ml, RMS = 0.026 mmHg/ml. Passive elastance E p vs LV volume for the data of figure 2. Passive elastance Ep vs LV volume V, for the sample case shown in Figure 2. We now propose to adopt Ep as a measure of LV resistance-to-filling. Hence during ejection, both Ea and Ep are varying. During ejection and filling phases, Ep can be calculated at any time using equation (17). Likewise, Ea can be calculated during ejection and filling phases using equation (8), once its parameters have been determined by employing equation (12-b & 12-b) during isovolumic contraction and relaxation phases. Their values during the cardiac cycle are listed in Table 1. The analyses, presented herewith, are now applied to clinically obtained data consisting of the subject's left ventricular (instant-to-instant) dimensions (obtained by cineangiocardiograph) and chamber pressure (obtained by cardiac catheterization). For each subject, passive and active elastances are determined from the left ventricular data. Table 2 provides the measured data and the model-derived parameters for three subjects (subject HEL, DDM, and ML). Subject HEL serves as a sample patient with myocardial infarct, subject DDM with double vessel disease (DVD) and hypertension, treated with PTCA; subject ML with idiopathic myocardial hypertrophy (IMH). 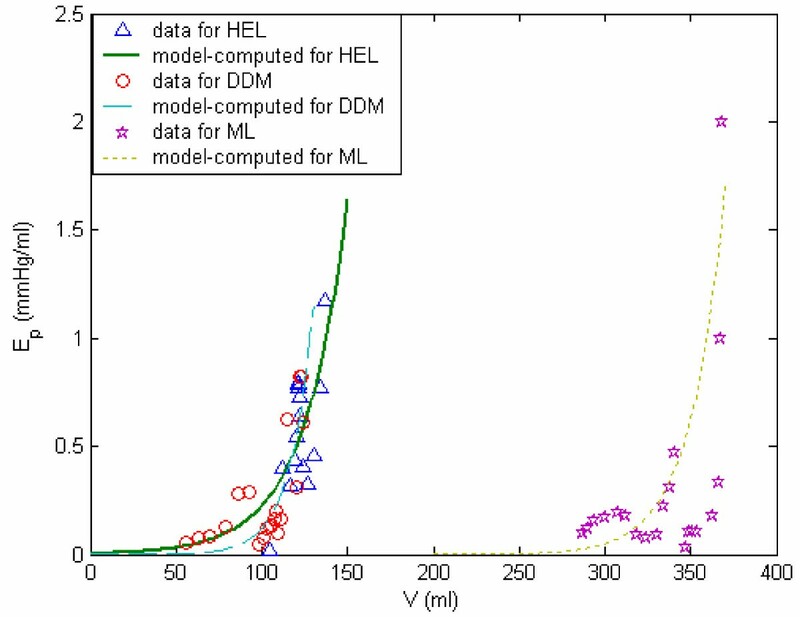 The variations of model-derived nonlinear passive and active elastances for the subject HEL are shown in Figure 7. For this particular subject (HEL), the maximum active elastance is 1.37 mmHg/ml. In Figure 8, we have plotted Ea vs incremental pressure (P-Ped) for this patient HEL. Note that the elastance is much higher at late-ejection than early ejection. This is because of a continuing sarcomere stress development and shortening. The active elastance reaches its maximum value at late-ejection (point 15), and thereafter decreases. However as shown in Figure 7, even after the end of relaxation phase (point 21) the active elastance continue to decrease into the filling phase. This decrease can explain the suction effect during the rapid filling sub-phase, even after LV filling has commenced. Pressure, active elastance E a , and passive elastance E p and total E = E a + E p for the data of figure 2. Pressure, active elastance Ea, passive elastance Ep, and total E = (E a + E p ) for the sample subject shown in Figure 2. 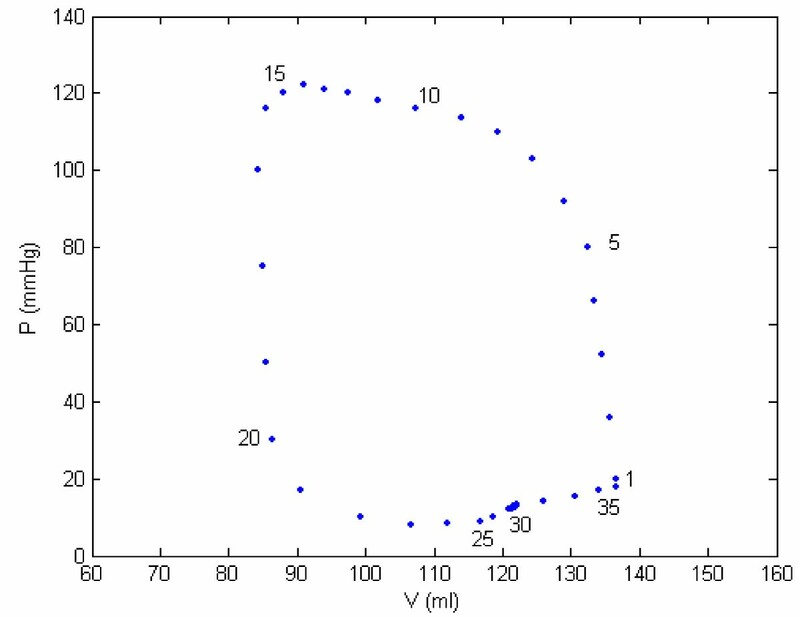 In this figure, 1–5 represents the isovolumic contraction phase, 5–17 represents the ejection phase, and 17–21 represents the isovolumic relaxation phase, 21–37 represents the diastolic filling phase. Active elastance vs. incremental pressure. Active elastance vs. incremental pressure (P-Ped) for the same subject as shown in Figure 2. The arrow direction indicates progression of time; 1–5: isovolumic contraction phase; 5–17: ejection phase. Note the rapid decrease in Ea during the isovolumic relaxation that also extends into the filling phase, and causes suction of blood into the LV even before initiation of left-atrial contraction. Figures 9 and 10 provide representations of the nonlinear passive and active elastance for subject HEL (with hypertension), DDM (myocardial infarct), and ML (idiopathic myocardial hypertrophy). 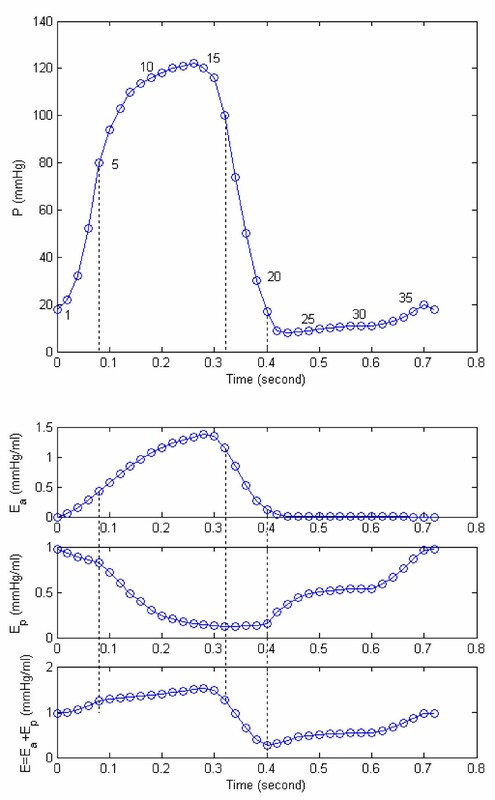 The Ep vs LV volume plots, in Figure 9, clearly reveal that Ep increases exponentially with increase LV volume; the parameters (EP 0and z p ) characterize this relationship. The passive elastance curve is steeper for a stiffer myocardium, with a corresponding bigger value of the exponential coefficient Z p (subject ML). 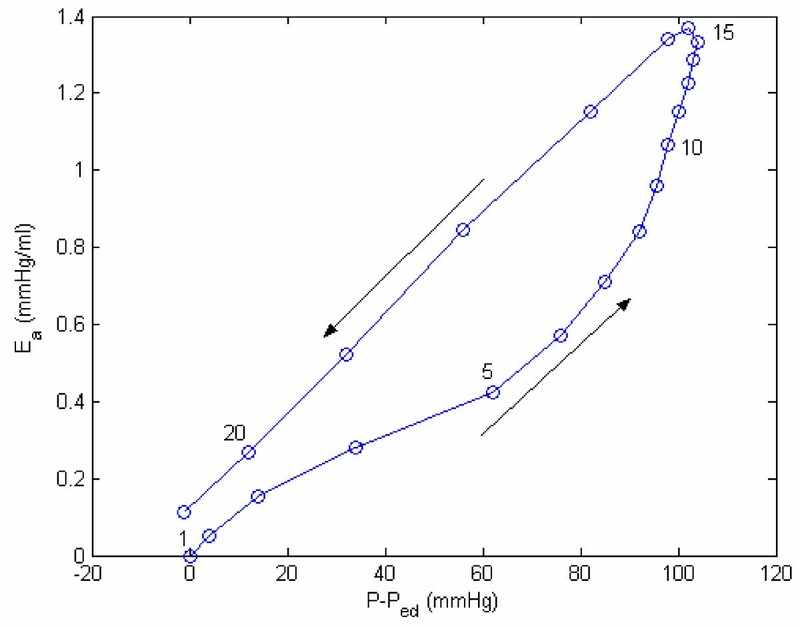 The Ea vs incremental pressure (P-Ped) plots, in Figure 10, reveal the development and decrease of Ea during systole, which in turn governs the generation of LV pressure. LV volume and corresponding volume-dependent passive elastance. 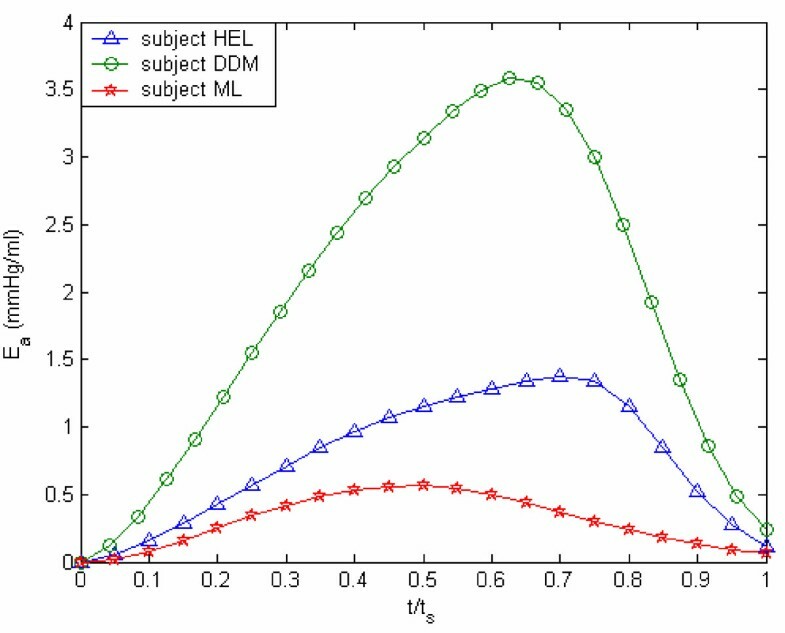 Volume-dependent passive elastance (Ep) for subjects HEL, DDM, and ML. Active elastance vs. incremental pressure. 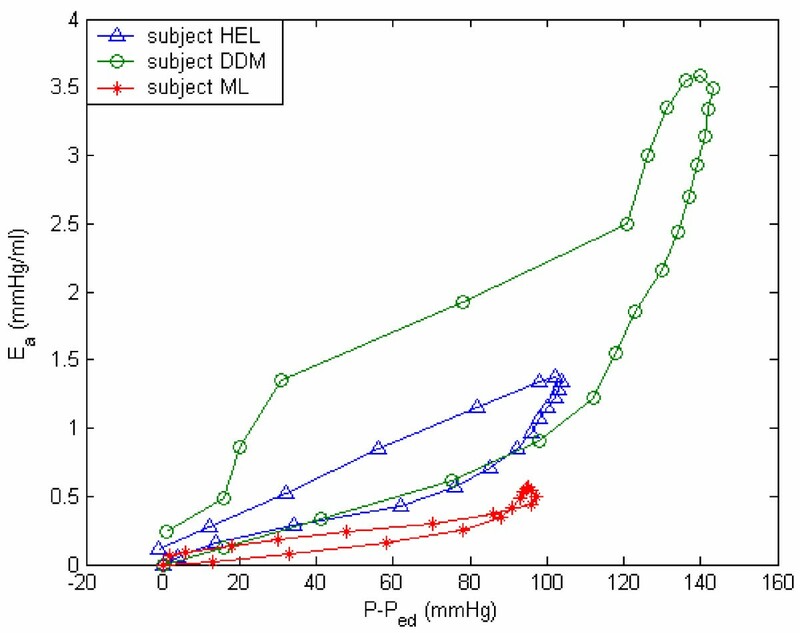 Active elastance vs. incremental pressure for subjects HEL, DDM, and ML. Yet another way to study Ea variation is by means of the Ea vs normalized time (t/ts) plot, shown in Figure 11. These two figures 10 and 11 make us realize that Ea,max could be regarded as an index of LV contractility. Hence, we decided to plot Ea,max vs the traditional contractility indices of EF and (dP/dt)max. These plots are displayed in Figures 12 and 13. It is noted that Ea,max has a high degree of correlation with both EF and (dP/dt)max. 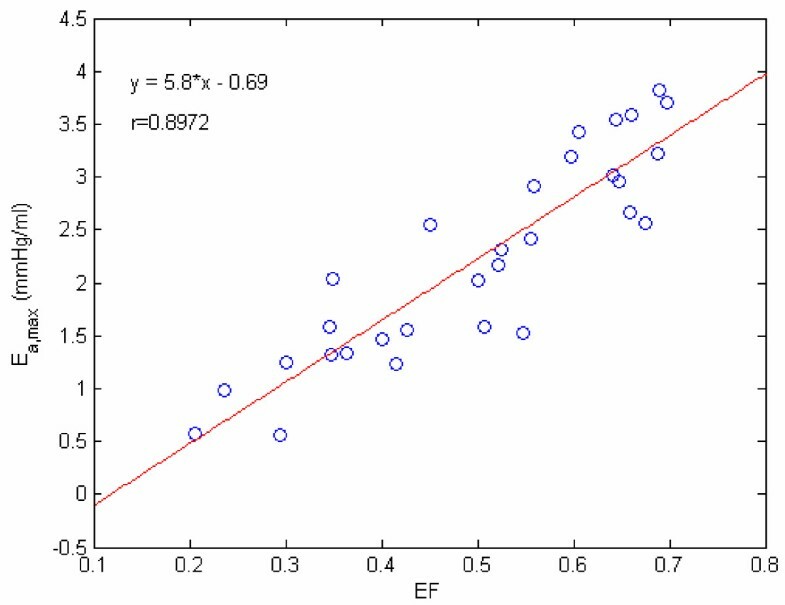 It is interesting to compare our correlation-coefficient value (0.8972) with the value of 0.89 obtained by Mehmel et al , although this paper computes elastance as an extrinsic property = [P/(V-Vd)]es. Active elastance vs. normalized time. Active elastance vs normalized time (t/ts) for subjects HEL, DDM, and ML. 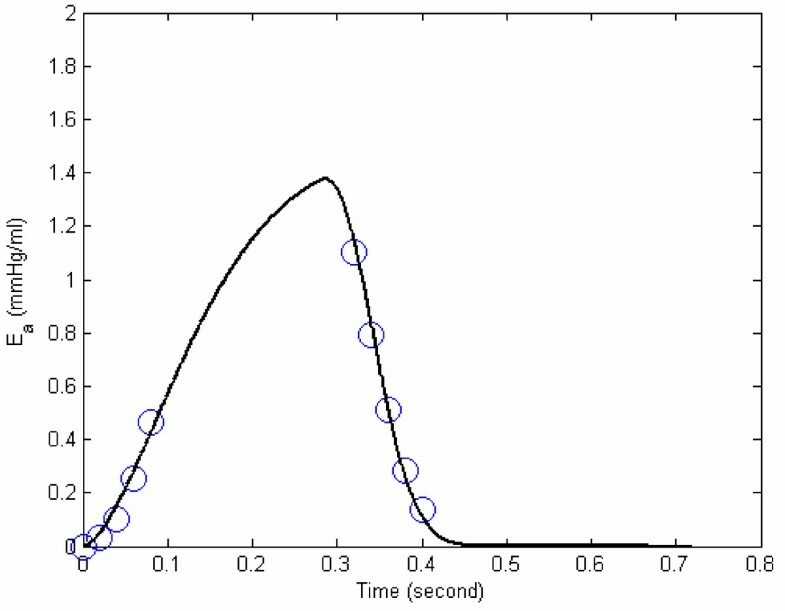 Herein, ts is the duration from start-of-isovolumic contraction phase to end-of-isovolumic relaxation. E a,max vs EF. Relating our contractility index Ea,max to EF factor, with r being the correlation coefficient. E a,max vs dP/dt max . Relating our contractility index Ea,max to the traditional contractility index dP/dtmax, with r being the correlation coefficient. term, based on the calculation of its value being of the order of 10-2 compared to (i) (E p,i + E a,i )(V i - Vi-1), which is of the order of 100 and (ii) V i (E a,i - Ea,i-1) which is the order of 101. Substituting these values into equation (18) gives (P22 - P21) = -3.22 mmHg, confirming decrease of pressure during early filling. Hence, our novel concept of "decreasing Ea during the early phase of filling" enables us to explain the phenomenon of decreasing LV pressure during the early stage of filling. In other words, it is suggested that the sarcomere actin-myosin activity continues into the filling phase. The decreasing Ea during the filling phase seems to reflect decreasing sarcomeric activity during filling. Likewise, the increase in Ea during isovolumic contraction is responsible for increase in LV pressure at constant volume, as demonstrated by means of equation (11). Substituting these computed values (listed in Table 1) into equation (20) gives P10 - P9 = 1.92 mmHg, which is approximately equal to the actual value of 2 mmHg. Previous works have described elastance as a derived parameter from LV pressure-volume data, based on the definition of P / (V - V d ) [9, 10, 12–14]. Also, Emax (given by ESPVR) as illustrated on Figure 1 varies with different arterial loading states and is therefore load dependent , and not an intrinsic index independent of LV loading states. Our concept of Ea enables us to explain (i) the generation of pressure during isovolumic contraction and decrease of pressure during isovolumic relaxation, when the volume is constant, and (ii) the decrease of pressure during the rapid filling phase. Our concept of decreasing Ea along with increasing Ep during filling, which enables us to explain the LV suction effect during early filling, is indirectly supported by the work of Shoucri . He has indicated that the LV wall stress during the filling phase is made up of two components: (i) a passive increasing component due to LV pressure and (ii) an active decreasing component due to decreasing active fiber stress. However, the determination of this active fiber stress in his paper is empirical and not based on a well-defined concept and expression for Ea, as provided by us. Finally, both Ea and Ep are invoked to explain the variations of pressure during the ejection and filling phases. From the viewpoint of intrinsic indices of LV assessment, Ep can represent LV myocardial stiffness property and resistance to LV filling. On the other hand, Ea has been shown to correspond to LV contractility, by means of Figures 12 & 13. Therein, we have shown a high degree of correlation between Ea,max and (dP/dt)max as well as EF. In future, we can also couple our LV model (of Ep and Ea) with an arterial lumped-parameter model (consisting of total peripheral resistance R, total arterial compliance C, aortic characteristic impedance Z0 and inertial L) in order to simulate and explain the mechanisms of chronic hypertensive states , in terms of alteration in E a itself as a measure of LV adaptation to chronic hypertension induced in the circulation system. Dynamic equilibrium of a myocardial element. Dynamic equilibrium of a myocardial element. Element mass m e = ρ(2r1dθ1)(2r2dθ2)h = (ρh)(4r1r2dθ1θ2) = ρhA e = m s A e ; dσ i = (dP el )(r i ) / (2h), (i = 1, 2); dP el is the incremental elastic-recoil pressure. For dynamic equilibrium of the myocardial element, m e + 2(dσ1)(2r2dθ2h) + 2(dσ2)(2r1dθ1h) - A e dP LV = 0, or m e + A e dP el - A e dP LV = 0. For our LV spherical geometry model, r1 = r2 and dσ1 = dσ2. where the myocardial element mass, m e = m s A e , m s (the myocardial surface-density or mass per unit surface area) = ρh, ρ is the myocardial density, and u is the radial displacement, dP el and dP LV are the incremental elastic-recoil and left ventricular pressures (as depicted in Figure A-1). where R e is the resistance to LV filling (through the open mitral-valve), ρ f is the blood density and v is the blood velocity at site 2. Liang Zhong, Dhanjoo N Ghista contributed equally to this work. We are grateful to Dr. Terrance S.J. Chua and Technician Mr. Ng Eng Hian from National Heart Centre, Singapore, for his technical assistance in cineangiographic recordings. This study was supported by grants from Strategic Development Scheme, Nanyang Technological University, Singapore. Liang Zhong carried out the elastance studies, participated in data acquisition, performed statistical analysis and drafted the manuscript. Dhanjoo N. Ghista conceived of the study, and participated in its design and coordination and helped to draft the manuscript. Eddie Y-K Ng participated in coordination and helped to draft the manuscript. Soo T Lim participated in its design and coordination. All authors read and approved the final manuscript.